A well-known mountain ridge in Palestine; ("the garden" or "garden land," with the definite article) is usually given in the Bible. 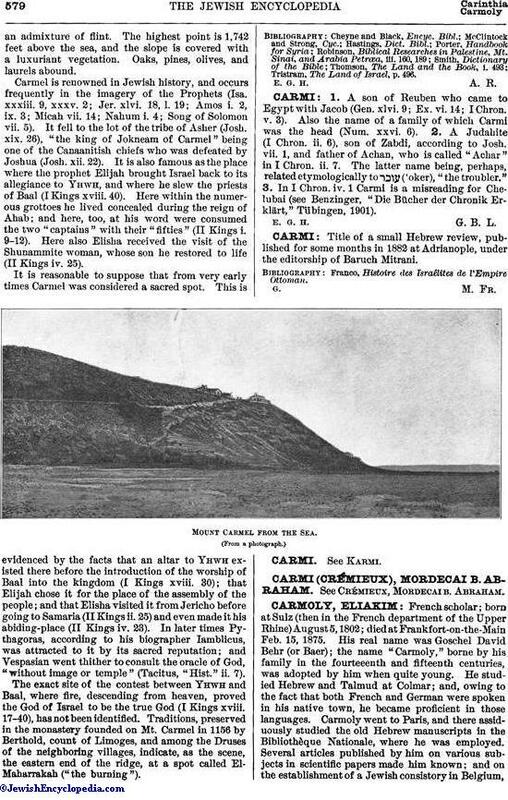 It is known in later Hebrew as , and in modern Arabic as "Kurmul," but more usually "Jabal Mar Elyas." Extending from the plain of Esdraelon to the Mediterranean, it terminates in a steep promontory in that sea, about nine miles south-west of Acre. The formation is of limestone withan admixture of flint. The highest point is 1,742 feet above the sea, and the slope is covered with a luxuriant vegetation. Oaks, pines, olives, and laurels abound. Carmel is renowned in Jewish history, and occurs frequently in the imagery of the Prophets (Isa. xxxiii. 9, xxxv. 2; Jer. xlvi. 18, 1. 19; Amos i. 2, ix. 3; Micah vii. 14; Nahum i. 4; Song of Solomon vii. 5). It fell to the lot of the tribe of Asher (Josh. xix. 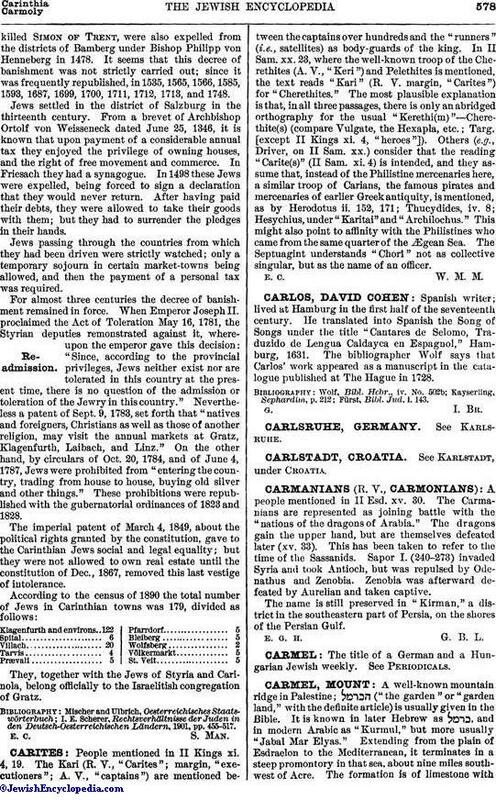 26), "the king of Jokneam of Carmel" being one of the Canaanitish chiefs who was defeated by Joshua (Josh. xii. 22). It is also famous as the place where the prophet Elijah brought Israel back to its allegiance to Yhwh, and where he slew the priests of Baal (I Kings xviii. 40). Here within the numerous grottoes he lived concealed during the reign of Ahab; and here, too, at his word were consumed the two "captains" with their "fifties" (II Kings i. 9-12). Here also Elisha received the visit of the Shunammite woman, whose son he restored to life (II Kings iv. 25). It is reasonable to suppose that from very early times Carmel was considered a sacred spot. This is evidenced by the facts that an altar to Yhwh existed there before the introduction of the worship of Baal into the kingdom (I Kings xviii. 30); that Elijah chose it for the place of the assembly of the people; and that Elisha visited it from Jericho before going to Samaria (II Kings ii. 25) and even made it his abiding-place (II Kings iv. 23). In later times Pythagoras, according to his biographer Iamblicus, was attracted to it by its sacred reputation; and Vespasian went thither to consult the oracle of God, "without image or temple" (Tacitus, "Hist." ii. 7). The exact site of the contest between Yhwh and Baal, where fire, descending from heaven, proved the God of Israel to be the true God (I Kings xviii. 17-40), has not been identified. Traditions, preserved in the monastery founded on Mt. Carmel in 1156 by Berthold, count of Limoges, and among the Druses of the neighboring villages, indicate, as the scene, the eastern end of the ridge, at a spot called El-Maharrakah ("the burning"). Tristram, The Land of Israel, p. 496. E. G. H. A. R.